As of late July/August 2013 I’ve had some family related troubles come up that are making it very hard to work on the SR5 character sheet; as soon as I released 2.5a I took a break so that I could return to it with a fresh perspective, and things have come up that make it so that I won’t be getting back to it until well after something better gets made. So I figure that I may as well get with the program and release what I have now, so that people can keep making better stuff off of it. If you’re in a hurry and want to skip the tutorial on how to use the stuff, just jump to the bottom, but I can guarantee you’ll want a quick course on the subject if you haven’t done this sort of thing before. One of the important things that you need to know is how to open up the character sheet for editing. 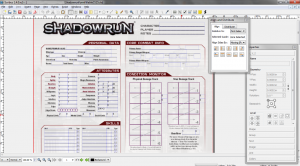 I’m not going to redistribute the plain .pdf of the original character sheet-you can get it from Shadowrun’s website, but what you’ll want to do is get a recent version of Inkscape, and open up the .pdf. You won’t be able to re-save it as a .pdf, but you can save it as a .svg (for maximum editing later) and/or as a .eps file, which is what I use to get it into Scribus. I’ve found that Scribus won’t do the third-page text no matter what I do, so I export text to outlines since it turns out better (EPS isn’t a fan of bitmaps, apparently). If you have a desire to do some really cool stuff and make your own sheet using the pre-made design elements, you’ll have to ungroup them; for some reason there’s not a whole lot of rhyme or reason to this, and Inkscape will parse the text wrong (you’ll basically have to scrap it). Once you get the elements ungrouped, you can just move them around on the page and put them where they need to be, then save the whole thing as EPS and take it directly into Scribus. For fonts, I use Grishenko NBP and Pigiarniq Heavy (or normal w/outline, I’m inconsistent), so if you don’t have the fonts you’ll probably get a bit of a problem from that. Again, I’m not 100% sure the distribution, but so long as you don’t embed them (not a problem due to outlining text) most fonts will let you use them in a non-commercial project; Grishenko’s free and Pigiarniq’s a government-owned font up from a Canadian place I don’t know enough about to describe; it has character sets for several indigenous languages, apparently, but its English fontset is pretty close to the $150ish font that Catalyst used. Either way, the fonts aren’t perfect, but they’re maybe 80% accurate to the originals, and unless you really think about it you probably won’t notice. That’s about all the help I’m going to give for Inkscape; you’ll have to worry about aligning stuff on the page and the execution yourself, but so long as you remember that Shift+Ctrl+G (or equivalent) to ungroup it’s pretty simple for anyone who’s used a vector graphics program to do stuff. 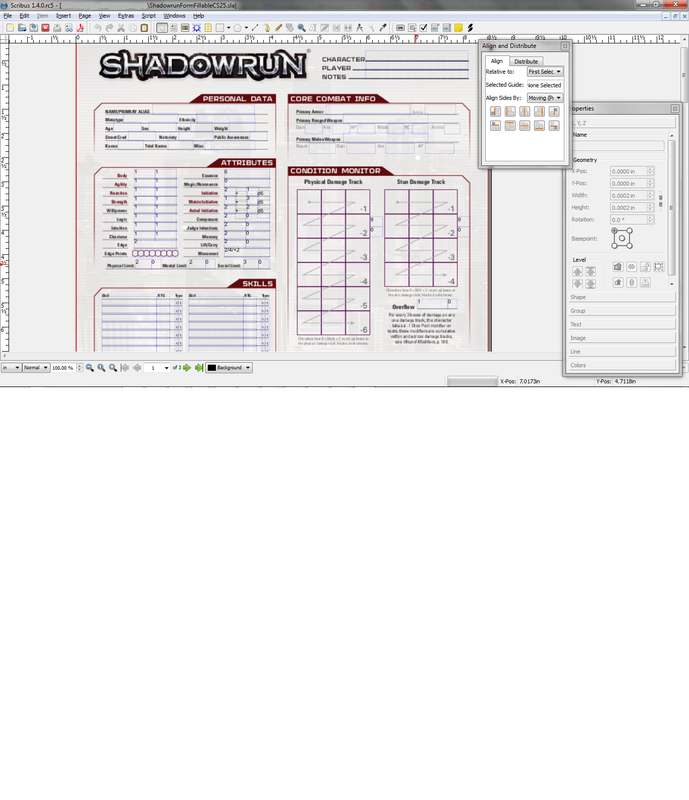 Just remember that .eps hates bitmaps, but it’s still the best format to move stuff over; I took the Shadowrun logo and exported a .png by itself which I then feed back into my character sheet to keep the familiar look. Note that the .sla files provided need, respectively, the 3rd page .eps I’ve provided in the .zip, and the original character sheet .pdf. For some reason, Scribus doesn’t like taking text usefully form .eps, and I’ve had mixed luck with getting my own text fields to be searchable, but you can definitely search the original sheet’s pages. You’ll also need Ghostscript; I’m not sure if version matters but I used the most recent 64-bit version. You can find tutorials for installing them elsewhere; you’ll want to find the binary executable of the console version of Ghostscript; my install path on Win7 is “C:\Program Files\gs\gs9.07\bin\gswin64c.exe”. This doesn’t show you a whole lot, and it is somewhat modified by my desired workflow; this is what I always use. On the right you can see the Properties docking window, which is pretty much going to be your go-to tool (I have the align because I like getting stuff perfectly even, but the Properties window can set the XYZ of things, doing the exact same job). However, since most of our layout is done in Inkscape, we don’t have to worry too much about being super proficient in Scribus. 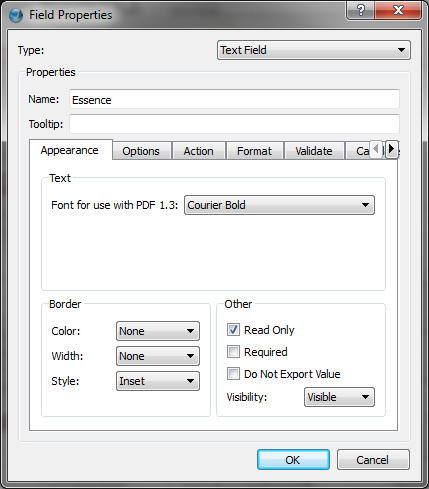 Go ahead and double-click on one of the thinly outlined text fields that already exist in the PDF; you can create more by either CTRL-C copying them (or any other of your preferred methods of duplication), or by hitting the Insert PDF Text Field button on the upper right then dragging the appropriate boundaries; it’s sandwiched between the “OK” icon for creating buttons and the “Checked box” icon for making, well… check boxes. 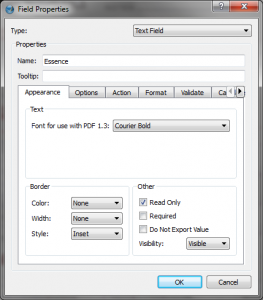 This is the actual PDF Text Field Properties window which is where you set up the interactive bits of the sheet. I’ve selected the Essence box, which is checked “Read Only”. Do this if you’ve got a calculating field, since it’ll remove the yellow outline in the PDF reader; otherwise this page is mostly important for showing the Border settings-I find that such a busy sheet works best when the individual fields don’t have a black outline that stacks up and gets really sloppy looking (note that many of the fields overlap). Next is the part where the magic happens. This is the calculation tab. 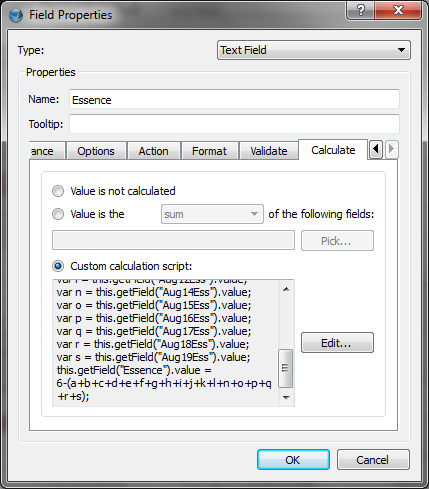 Whenever calculations for a field are done (which can take a second or two of fiddling with other fields for some of the fields that draw from other fields that are calculated, there seems to be a “trickle-down” effect for the calculations), this is what tells them what the new contents of the field will be. Whether or not you checked the “Read Only” spot on the first page, this is where things happen. 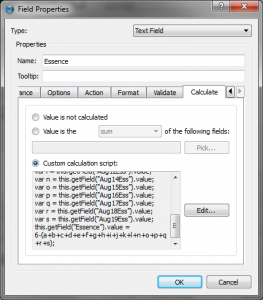 You’ll notice that each field has a name, both the field that is being calculated and the fields being calculated from. You can change these in the Properties docking window, under the “X, Y, Z” tab; I leave most of my fields just called “Text#” or whatever Scribus thinks it should call them because that way I can gloss over them, but it’s important to get everything right here.